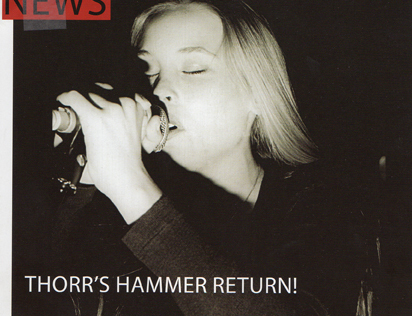 Rock-a-Rolla interview: Thorr’s Hammer Return! Thorr’s Hammer, the cult doom outfit featuring Sunn0))) duo Stephen O’Malley and Greg Anderson, have reformed for a very special performance at this year’s Supersonic Festival in Birmingham, UK. The band, active for a total of 6 weeks in 1994/1995, produced an EP and a demo, and disbanded once vocalist Runhild Gammelsæter aka Ozma, returned to her native Norway, ensuring their cult status and remaining the stuff of legend – until now. Runhild fills us in on underground metal’s unlikeliest comebacks. How did this reunion happen? We have talked about doing a reunion on and off for the last 10 years. Earlier I was negative, as I didn’t like new versions of bands who did ‘reunions’ years after. Sometimes the imaginary, epic memory of an old band can be disturbed by waking it back up to life – and the once handsome musicians are now old and wrinkly. But I am older now, and a bit more flexible in my thinking, and perhaps more nostalgic. Last year, Stephen brought up the reunion idea and all of us felt it was a good idea, that it, most of all, would be fun to play together again. Stephen really likes Supersonic festival and approached them about it. So it’s not like we had offers to play for big money or anything. Actually, I would like to point out that we are making no money on this. It’s almost the same line-up: yourself, Stephen, Greg, Jamie Sykes and Guy Pinhas. What happened to original bassist James Hale? Frankly, I don’t know. I lost touch with him when I left the states. Why, do you think, given such a short lifespan and hardly any recordings, did the band go on to be such cult favourites amongst the extreme metal underground? Four things. One: the music is quite good, if I may say so. Our stuff was different from other metal bands then and I can’t think of another band with the same sound since. I don’t believe we would be cult today if people didn’t enjoy the music. Two: a small teenage girl with very long blonde hair growling like a man is very noticeable amongst the bands composed of dudes in black t-shirts. Three: being in the right place at the right time. TH is a child of its time, and a cross-cultural band. We made a new mix of different genres: grungy doom, which was born in Seattle at the time by bands like Earth and Tad, together with Norwegian vocals about Vikings, which was used by the Norwegian black metal bands. To sum it up, we were into Norwegian black metal, from all parts of the world, and lived in Seattle when grunge and doom were born. Four: Steve and Greg went on to become big rock stars with Sunn0))), so people started looking into their other projects. That being said, the surprising thing for me is that the record has sold evenly through all these years. It hasn’t sold a lot, but we keep selling copies after 15 years, without any promotion or touring, which I think is quite rare. I am very grateful to the people who like our music and have kept the word of mouth of TH alive for all these years. Are you planning to do anything more after Supersonic? Any new music maybe? We might make some new music, I don’t know yet. TH is friends having fun; we’ll do whatever we like. But we will never be a tight band doing tours. Our jobs and other projects don’t allow it, and TH is and always will be old school and low key. I like that we are cult, it makes me proud.